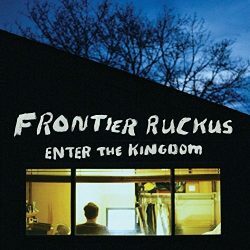 Frontier Ruckus are a band that I should love: they have all the ingredients to draw me in with an agreeable blend of Americana stylings with lively dashes of power pop, literate lyrics and fine melodies. What’s not to love? The lyrics, no not even that, the subject and the settings are fine. It’s the formal structures, the rhyming schema, too clever by half buried rhymes, or laboured trowelled on poetry, the kind that says I’ve paid for my education and I’m going to use it. It irks me because they are so close to something really wonderful. Gerunds is melancholic with a swooning squadron of strings – sure the vocals are a little underpowered but that doesn’t bother me, just the highlighted lyrical flourishes that grate. The positive nadir of this is Sarah Springtime which sets the scene beautifully then launches into the chorus that’s so pleased with itself that the singing saw can be ignored. With a song potentially this good Clem Snide would have nailed it – they failed it, the rhymes derailed it. The banjo and string arrangement for Since Milford are unencumbered by lyrical baggage, the steel guitar eloquently carrying the song forward. There are many moments of beauty, many songs start with a flourish – the title track starts with aching strings that can flutter a heart. The whole record sounds wonderful – it may just be, nay must be, me that has the temerity to find the whole enterprise rendered awkward by the displays of lyrical dexterity. At times it sounds like a Delgados record with the strings a central tenet of the sound, only Alun Woodward or Emma Pollock enhanced their arrangements with lyrics that sat within the songs rather than smashed out of them and demanded attention. I keep going back many times but the rhymes are like ticks in my skin – I can’t ignore them. The irritation much to my consternation, is catching.